Eulàlia completed her doctoral thesis at the Institut de Recerca Oncològica (IRO) in Barcelona at the Department of Medical and Molecular Genetics headed by Dr. Xavier Estivill. The experimental work was focused on elucidating the functional role of unknown genes that map in the human chromosome 21 (HC21). The group named it DSCR1 (Down Syndrome Candidate Region 1) and it was reported as an endogenous regulator of calcineurin phosphatase. 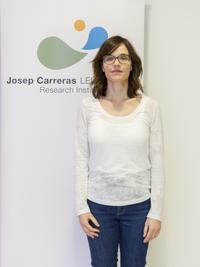 As a postdoctoral researcher she joined the CRG in Barcelona, where she continued working on the DSCR1 protein elucidating the inhibition mechanism. Her experience in the ALL field began when she started a postdoctoral position in France, in the laboratory of Dr. Jacques Ghysdael at the Institut Curie in Orsay, Paris. There she investigated the pro-oncogenic function of the calcineurin/NFAT pathway in a mouse model of T-ALL induced by over expression of Notch 1 in pre-leukaemic cells. The leukaemic mouse model allowed the group to find evidence that calcineurin is key for the re-initiation of leukaemia in mice. After moving to the Institut Universitaire d'Hematologie in the laboratory of Prof. Jean Soulier, also in Paris, Eulàlia's research in ALL disease became more clinically oriented. She developed a xenograft mouse model of T-ALL and used it to functionally characterize two candidate tumour suppressor genes. Currently, she is in charge of the laboratory for the T-ALL research line at the Josep Carreras Leukemia Research Institute. Here her research is focused on the identification of copy number alterations as targets for available drugs involved in T-ALL leukemogenesis and prognosis.